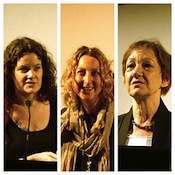 In the photo montage on the left (by Catherine Cronin on flickr), pictured speaking at last week’s symposium in Trinity College Dublin on Disrupting Higher Education were, (from the left) Audrey Watters, Sian Bayne and Diana Laurillard. I have already blogged about the introduction to the symposium here, and about the first speakers here, including Laurillard’s contribution. Watters and Bayne spoke in the afternoon session, which was opened by Dr Rob Robinson (Solutions Director at Blackboard; President of the US Distance Learning Association) on the institutional components for quality online delivery. He began by observing that online delivering is currently at the edge of higher education institutions, but that the existence and evolution of MOOCs is increasingly pushing online teaching and learning to heart of those institutions. They are looking at online delivery for three reasons, to increase access, to meet social objectives, and to increase revenue. But if they are to be successful, they must get the quality right. “Quality”, he said repeatedly, “is an institutional commitment”. This requires that online delivery must align with the core mission of the institution, that online courses must have sound pedagogical design, that the technical infrastructure must be sufficient, and that there must be appropriate technical and academic support. He discussed these issues under various headings. First, he emphasised the necessity for appropriate planning and development: online learning must cohere with the institution’s vision and strategy (in fact, he repeatedly stressed that it is important to know what the institution’s strategy is and how online forms part of it); moves into online learning must be subject to an opportunities and capabilities analysis; and the financial modelling must be clear. Second, he stressed the need for appropriate curriculum and courses, under headings ranging from programme design, through faculty training and development, to appropriate support for courses. Third, he briefly considered the necessary technology. And fourth, he brought up the issue of marketing and recruiting: he said that if the goal is to drive new enrolments, then there must be a lot of activity around online marketing and recruitment, which is fundamentally different from offline marketing. And fifth, he emphasised that ongoing student support is critical. It was the voice of US experience in making an institutional commitment to online learning, scaling up from existing offerings, and provided a very different perspective from that provided by Chip Paucek earlier in the day. Next up was Dr Sian Bayne (Senior Lecturer in Education, Uinversity of Edinburgh) on MOOCs, distance education and the sentimental campus. She blogged her thoughts afterwards here, and her prezi is here. She observed that distance education challenges notions of university spaces, ask one theme of her talk was a consideration of what it means to be ‘at’ college, for distance students who are never ‘in’ college in the sense of being on campus. She explored a point that had come up in earlier presentations that some online students form a strong sentimental connection with the university and the city, and that others make a similar connection with the networked campus by engaging online with other students on their courses. The University of Edinburgh has a strategic commitment to the expansion of conventional online digital education, and it was the first UK institution to sign an agreement with Coursera, initially to deliver 6 MOOCs with over 300,000 enrolments targeted at first year undergraduate level. She shared the experiences of her Coursera connectivist MOOC on elearning and digital cultures (@edcmooc #edcmooc on twitter). Of the 42,000 who initially enrolled, 7,000 are still active about half-way through; the majority are in the US; there is a 60/40 female/male split; and 36% are aged 25-34. She and her co-instructors curated a great deal of content for each module of the course; they encourage the kinds of participation and collaboration discussed by Karen Kear earlier in the morning; each week’s work is anchored in google hangouts; and the instructors’ and students’ experiences are all aggregated on a group blog. And she shared one of the digital artefacts being created on the course, a gorgeous sliderocket slideshow by Ary Aranguez (blog | twitter) called (after Nietzsche) “invisible threads are the strongest ties”, which captures and presents many of the means of digital participation and collaboration that are at the heart of online education. Audrey Watters (Hack Education) considered the basic question of who owns education data; and, in particular, who owns our education data as learners? Her slides are here. There are plenty of possible answers: the students? their colleges? the Government? the providers of any software which contain the data? Or is it open source or public domain? Legislation in the US (FERPA) and the EU (data protection) provides legal protections and privacy frameworks for important issues over control of, access to, sharing of, and learning from, that data. But that legislation does not answer the important issue of who owns the data. It is an increasingly important question as we are creating more and more born digital content that is either transient, or locked up in proprietary locations, and either way is inaccessible. The amount of such data is large and growing; it includes not just traditional paper transcripts, but potentially include students’ every electronic engagement; and she posed a great number of questions that arise: do students know of this data? do they own it? can they control it? do they have access to it? can they download it? can they review it? do they have any consent before it is shared with third parties? Finally, there was a stimulating question and answer session, wrapping up the day, during which we were joined by Peter Norvig (Director of Research, Google), who joined us remotely via a Google+ hangout. He returned to the morning’s theme of flipping the classroom, and in answer to a question from the floor, he argued that a teacher or lecturer fulfils five fundamental roles, suggesting that if online teaching is to be really effective, online instruction must also fulfil these five roles: (i) the teacher brings an authoritative overview of the field; (ii) the teacher often brings enthusiasm and excitement about the field; (iii) the student sees the teacher’s authenticity in the field; (iv) a teacher’s diagnosis can resolve students’ issues of understanding; and (v) the teacher brings a stock of anecdotes and experience to enliven the individual stuff that comes up in classroom interaction. Picking up on this, and closing the event, Prof Brendan Tangney (TCD), who chaired the last session, said that it is the innovative teacher, pedagogically and technologically, who is and should be at the core of the debate. It was an excellent coda on an excellent day.